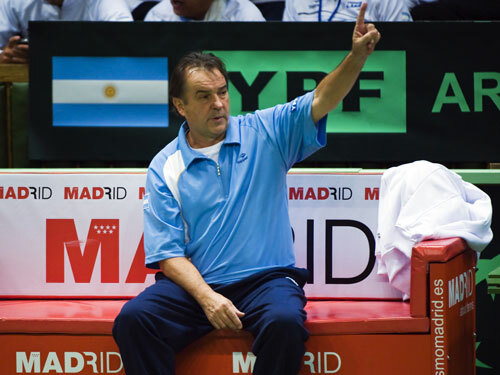 And finally, the least-photographed tie of the weekend; Shamil Tarpischev’s men once again took care of business in Moscow to progress to a quarterfinal against Argentina. Not to make Somdev Devvarman feel worse, but really the tie was lost when he failed to capitalise on an early lead against Kunitsyn on Friday and he lost once again today to Mikhail Youzhny who closed out the tie in straight sets. And that’s really all I’ve got. 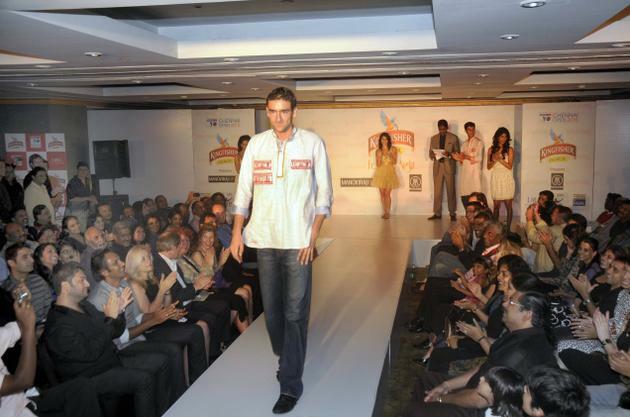 Even Mischa doesn’t seem that excited. And now for a quick (who am I kidding, mammoth) round-up of the ties still left to be settled on Sunday. Not the start that Spain wanted, as Nicolas Almagro lost a tough five-set match to Switzerland’s (in Davis Cup parlance) no. 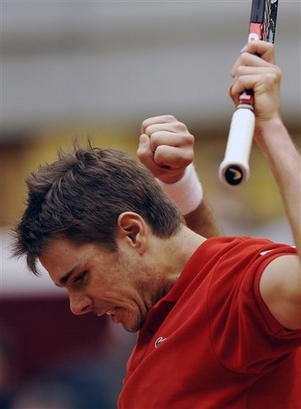 1, new daddy Stanislas Wawrinka. 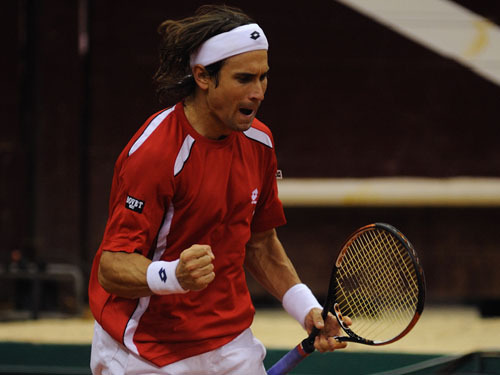 Luckily Davis Cup warrior David Ferrer was on hand to steady the ship, dismissing Marco Chiudinelli in straight sets to even things up heading into the doubles. 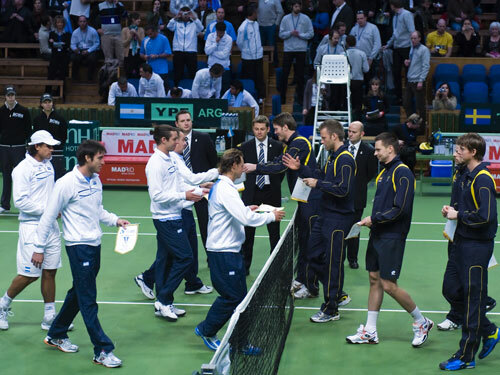 I thought that if Switzerland could win the doubles, they would have a nice chance of nicking the tie come Sunday. But there’s that damned depth again. 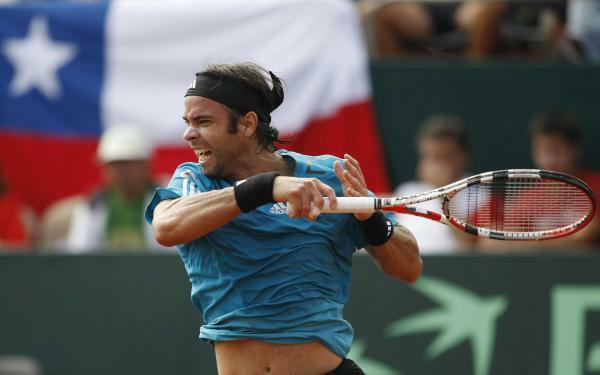 Perennial Davis Cup bridesmaid Marcel Granollers teamed up with Tommy Robredo to defeat Yves Allegro and Stanislas Wawrinka in four sets, leaving Switzerland 1-2 and with a fatigued top singles player heading in to Sunday. Nicely done, Spain. With Nikolay Davydenko out with an injured wrist and Igor Andreev suddenly sidelined with a knee injury, Igor Kunitsyn (who looks like he’s in the last stages of Shelleyesque consumption, but apparently isn’t) was hurriedly pitchforked into the team and did a nice job, grabbing a four-set win from India’s Somdev Devvarman before Mikhail Youzhny put Russia 2-0 up over Rohan Bopanna. 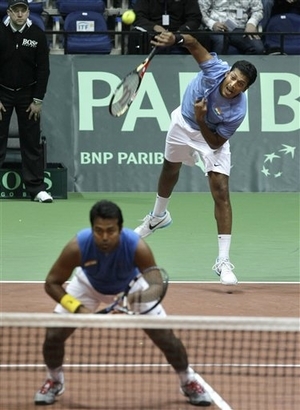 It’s not quite over yet, though, as Leander Paes and Mahesh Bhupathi once again put aside their history of falling out and teamed up to flatten Russia in the doubles, 63 62 62. Shamil despairs. Like a fox. 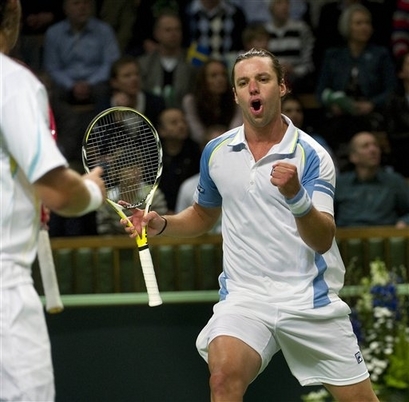 Things didn’t start off well for Our Heroes, as Eduardo Schwank was dismissed in straight sets by Robin Soderling. 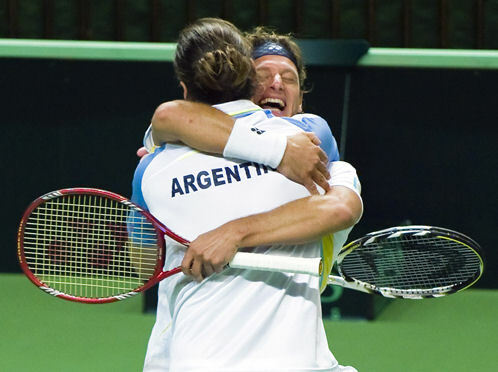 But an unlikely hero stepped up in the form of Leonardo ‘horseface’ Mayer, who came back from a set down to give Argentina their first point against Joachim Johansson. Actually the best photo of him I could find. And then who should hove into view (can you ‘hove’? did I make up that word?) 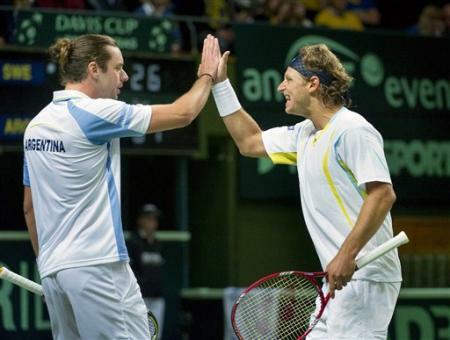 but El Rey himself, David Nalbandian, who teamed up with Horacio Zeballos to take the doubles from Soderling and Lindstedt in straight sets. 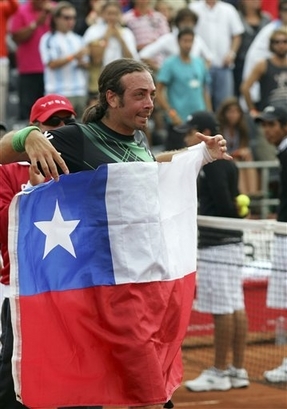 Understandably, Nalbandian will get a lot of the credit for this win, but I really have to highlight the brilliant performance of Horazio Zeballos. The Zebutante really impressed on his first Davis Cup outing, staying cool and frequently producing fantastic shots under pressure. I’ve never really watched him play before, but he must have produced close to if not his best tennis on this occasion, a hard thing to do in Davis Cup especially with a legend-in-his-own-lunchtime next to you on the court. Great stuff. If Argentina lose this tie (they will), it won’t be his fault. 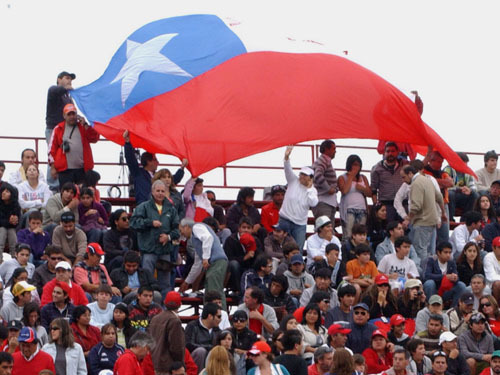 I’m told his nickname in Argentina translates to ‘onion’. Do with that information what you will. Well, well. Serbia looked well in control after Friday’s singles play against the next generation US team, with Troicki edging John Isner in four tight sets and Djokovic taking care of Querrey, also in four sets. 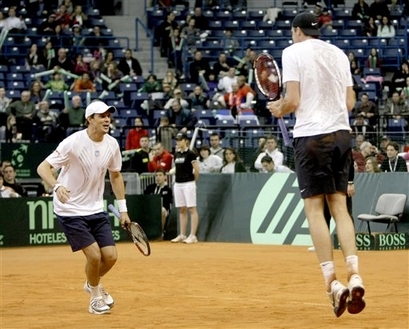 … the US won in four sets, 76(8) 57 76(8) 63, helped slightly by a controversial call in the third-set tiebreak but mainly by the level head of Bob Bryan and some really impressive work from John Isner. 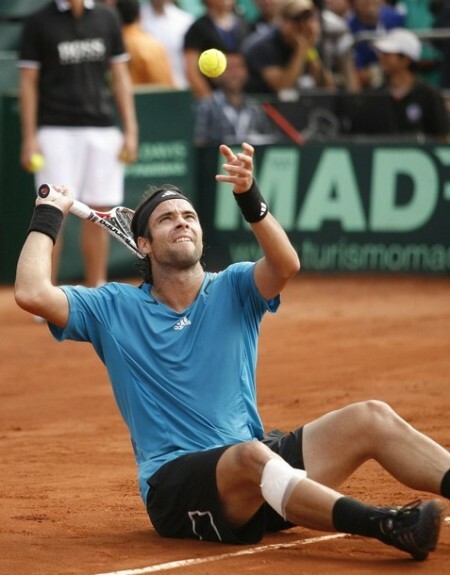 It takes serious, er, mental toughness to bounce back from a disappointing singles debut and put in the kind of performance he did in an unfamiliar milieu on his least favourite surface, against hostile crowd no less. Impressive. 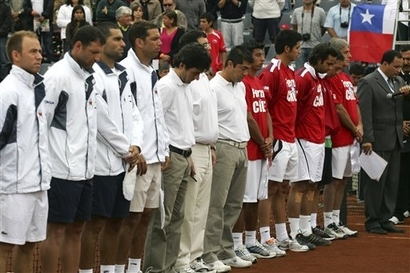 After a day’s delay (and a minute’s silence for the victims of the Chilean earthquake), the postponed tie got under way today with singles action and both Nicolas Massu and Fernando Gonzalez performed for their country, winning in four sets and (in Gonzo’s case) with the due amount of theatrics. 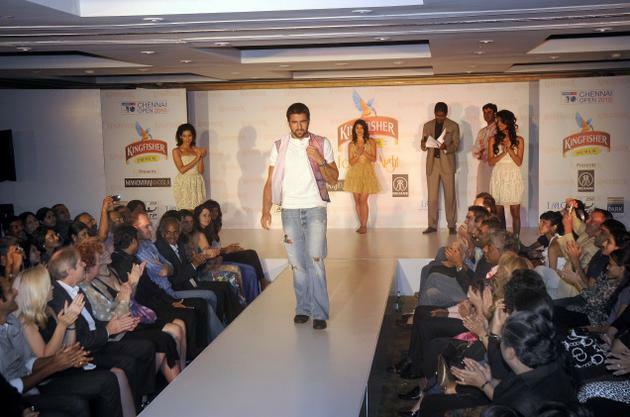 Player ‘Fashion’ Shows. Always Good for a Laugh. Psst, Marin. There’s a girl next to you? Oh, never mind. 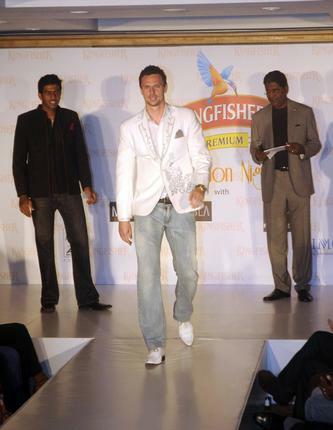 Robin gets his Daddy Cool on. 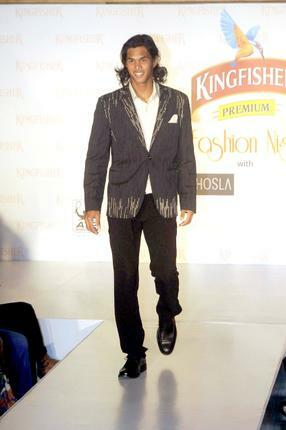 Somdev working some epic hair. Yuki working some epic eyebrows. Why does this look work on Tipsy?! 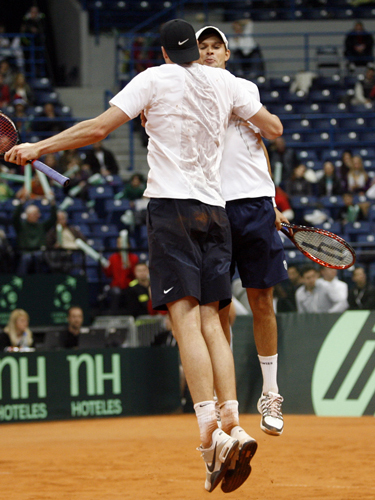 I can’t believe it’s time for my final Davis Cup picspam. God, I love this event so much. It should be played every weekend. “My work here is done,” he seems to say. Happiness is a champagne-soaked Belgian. I’m a sucker for behind-the-curtain photos. I’m also a sucker for Jo. 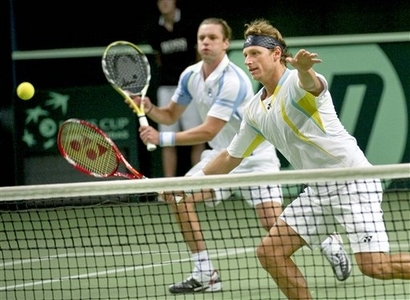 Back to the dustbin of tennis history with you, Thiemo de Bakker. Murray searches for an escape hatch to another country. 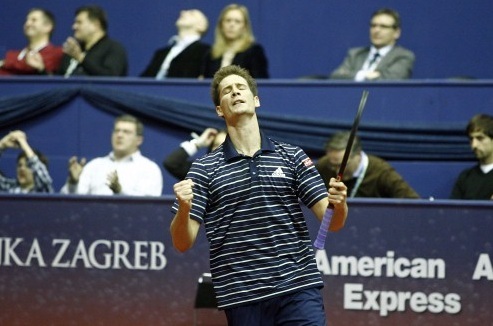 That’s pretty much how I reacted to the GB-Poland results. Except without the laughing. And my hair’s not as shiny. 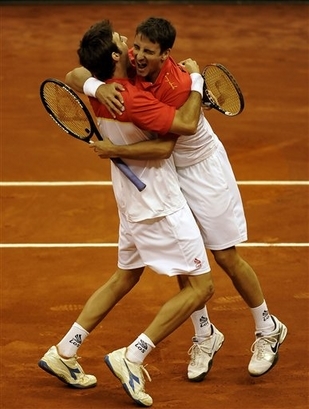 If there was a Crazy Cup, Serbia would win it hands down. I feel as if I’ve interrupted Robin’s dance routine. Yuki’s eyebrows really deserve a picspam of their own. So what was the craic today? 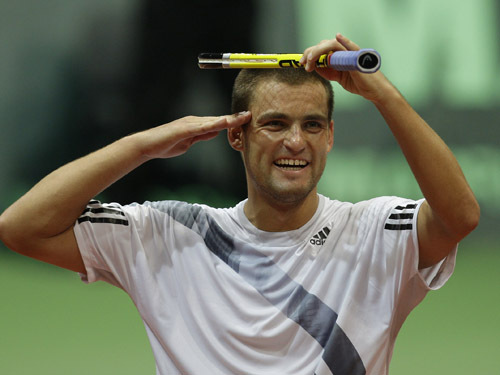 In the dead rubbers remaining of the semi-finals, both defeated nations salvaged some pride and a point, with Lovro Zovko defeating Lukas Dlouhy and Feliciano Lopez losing to Harel Levy in a result I deem genuinely Harel-arious. Andy Ram thinks it’s funny. The other nation who were 3-0 up, Serbia, humourlessly crushed Uzbekistan 5-0 courtesy of Troicki and Bozoljac, showing a Federeresque lack of mercy. Speaking of Federer, he did his bit for the land of cuckoo clocks, overcoming a rain delay and the awesome powers of Potito Starace to seal the deal for Switzerland 3-1. Fognini won a dead rubber, by which point Fed was presumably in a hot bubble bath. Quite right too, as after the match Roger revealed he has been struggling with a leg injury since the US Open final. Hopefully nothing a little time off won’t fix. France won their tie with the Netherlands 4-1. 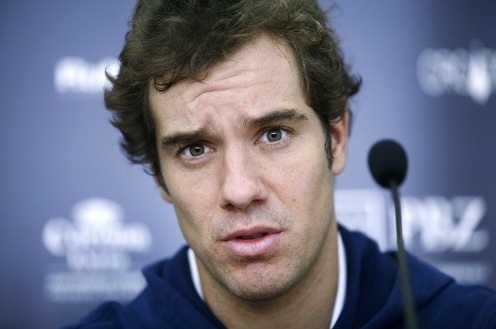 And by my calculations, at least 2.5 of said points were contributed by a certain Jo-Wilfried Tsonga. 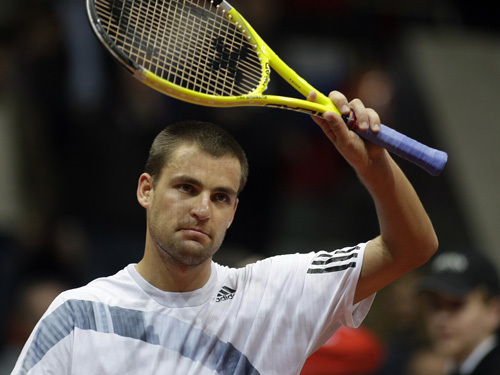 He backed up victories in Friday’s singles and yesterday’s doubles with a four-set victory over the bizarrely inspired Thiemo de Bakker to take the tie 3-1, with Jezza popping up handily to make it 4-1 over Huta Guleng. All of which is good, as it would be both sadness and madness for France not to be in the World Group. A hearty “well done” to Belgium, who held off a very determined challenge from the Ukraine. After Stakhovsky beat Malisse (yeah, he still plays, apparently) 63 36 06 61 63, it was all up to Steve Darcis, who delivered a comprehensive beatdown on Sergiy Bubka 62 61 60 to keep Belgium in the World Group. Like it. I mean, how often does Steve Darcis get to be the hero? I’m betting that even if you include his self-penned comic book series, The Heroic Exploits of Steve Darcis, the answer is still “rarely if ever”. 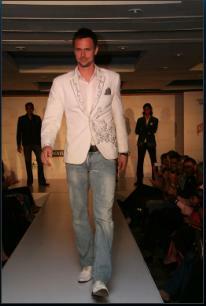 Robin Soderling was the hero for Sweden, beating Hanescu 75 61 60 to bounce Romania out of the World Group. I wish Mats was proud of me. Huge congratulations have to go to India, though. They’ve been out of the World Group since 1998, and now they’re back, thanks to a victory by Somdev Devvaman, who beat Rik de Voest of South Africa 36 67(3) 76(5) 62 64. 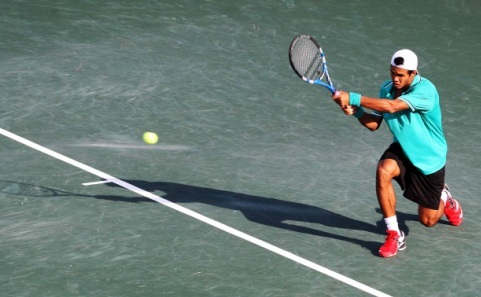 Devvaman came back from two sets and a break down in a match that lasted nearly five hours, and Davis Cup virgin Yuki Bhambri put the cherry on top by winning the dead rubber in three sets. Great stuff. I don’t know why this makes me happy, but it does. Oh wait – the ‘boks lost. That’s why. As of now, it looks like Ecuador will also be in the World Group, with Nico Lapentti just one set away from securing the tie against Marcos Daniel. Jurgen Melzer has split sets with Massu in his bid to keep Austria’s chances alive. Fun scoreboards still. Let’s hear it for two qualifiers who notched up good wins today. First up Somdev Devvarman beat Frederico Gil, 63 64 63. He can turn it on at times, can this kid. 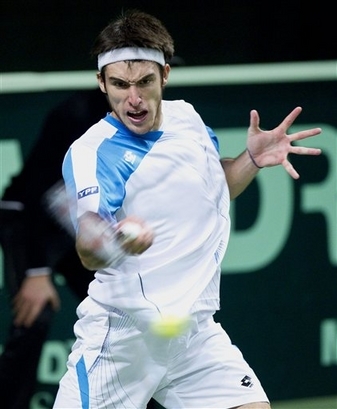 Then Marsel Ilhan of Turkey defeated Belgium’s Christophe Rochus in five sets, 36 63 36 75 75. This is all the more impressive because Ilhan is the first ever Turkish player to win a main draw match at a Slam. 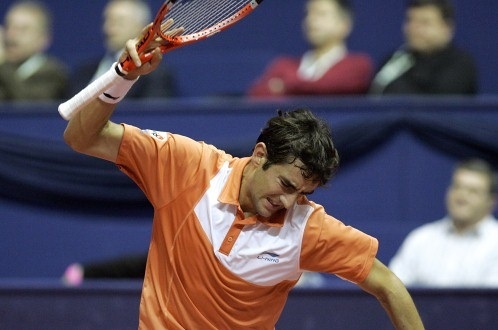 He’d already become the first Turkish player to ever reach the main draw after coming through qualifying. Here at New Balls, we like our milestones. How do you say ‘come on’ in Turkish? OK, first of all, what’s with dropping a set to Lu? What exactly is up with that? Oh, well. At least he won. And WHAT is up with that “cut here” line across his chest? 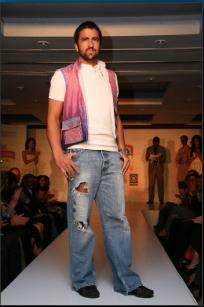 It’s like the groping shirt, but if you want to dismember him. Much less fun. 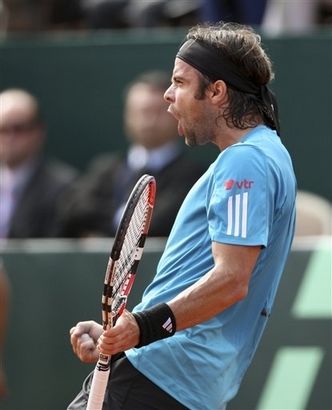 Boss beat Nico Lapentti in three sets (including a bagel) and Ernie maintained his proud streak of second round losses. 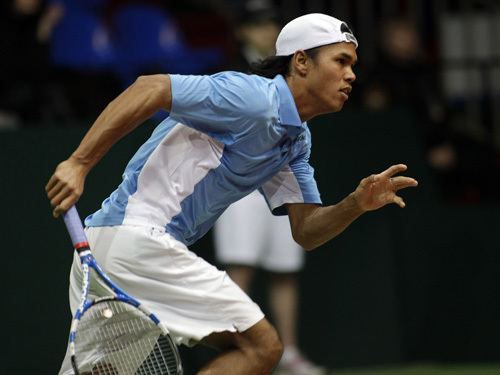 The big shock of the day was Somdev Devvarman knocking out my man Marin in straight sets. 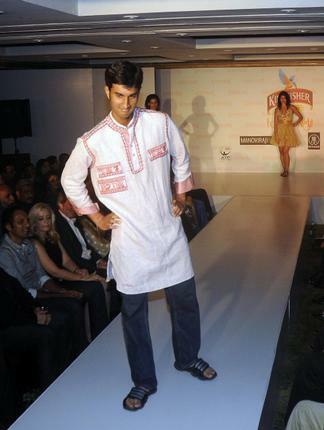 Somdev Devvarman. Straight sets. 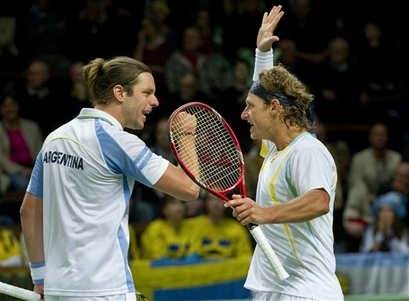 [WC] C Guccione (AUS) / L Hewitt (AUS) d  B Soares (BRA) / K Ullyett (ZIM) 46 75 12-10 – saved 2 M.P. Wednesday’s OOP here. 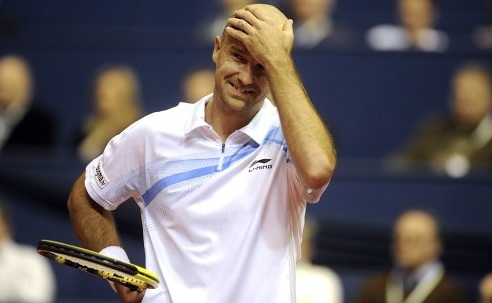 Roddick plays his first match against Becker, Tsonga plays Isner, and Boss plays Robredo. Fun stuff.